Have you ever gone back to read books you wrote some years ago? Most writers, I suspect, don’t. We write, we publish and we move on. Some writers say that when they do go back, it makes them uncomfortable to see their earlier, less formed self. They have learned so much in the meantime. Indeed, some remove their own books from sale, lest readers think this is the best they can do. But there is another response. Some of us return to old books to find ourselves surprised at how good they were. We have also learned much in the meantime, yet our earlier self was unexpectedly thoughtful. It is wonderful to discover. Last year, I returned to two books I had written many years ago, which were trade-published. I was so impressed with both that I re-launched both for new readers, after getting my rights back (much easier than you think). 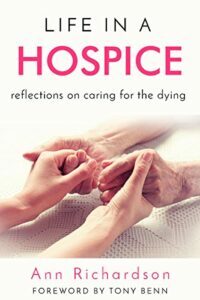 Ten years ago, I wrote a book offering the thoughts of hospice staff about working in end-of-life care, Life in a Hospice. It had been published by a highly respectable medical publisher and had a Foreword by Tony Benn, a well loved MP. Indeed, it was Highly Commended by the British Medical Association in 2008. But I was irritated by the lack of publicity by the publisher (taken over by a major conglomerate) and wondered how relevant it would feel today. Yes, what a delight. I was very touched by the stories and it felt fresh as a daisy! That prompted me to take back the rights and re-publish it as both a paperback and e-book, but added a new cover. RESULT: I must have been right, because after selling one or two books a year, it has sold nearly three hundred copies since March 2017. That’s not Harry Potter, but it is good for a book on hospice care. 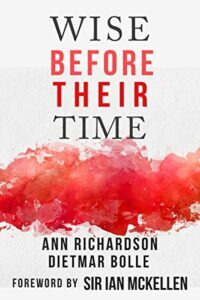 That experience prompted me to go back to a book I had published in 1992 setting out the personal stories of people with HIV/AIDS when it was a life-threatening disease, Wise Before their Time. It was long out of print, although there were second hand copies available on the net. I approached the task of reading it with some trepidation, as I could well have been embarrassed. On the contrary, I found myself incredibly moved by my own book, which I had not read for twenty-five years. Although the stories have no current relevance, as people diagnosed with HIV can now anticipate a normal life span, they had a historical significance. Again, I took the rights back and republished it as both a paperback and e-book, again with a new cover. RESULT: It is selling less dramatically, but selling nonetheless. And it has garnered nothing but five star reviews, which is pleasing. I am not a young woman, so these books – old as they are – were not written in the full flush of youth. Perhaps if I were able to go back to writings from my twenties or thirties, I would well be embarrassed. But for those of you who have traditional publications long out of print and wonder whether to just forget about them – think again. Take them out and have a look. You might be pleasantly surprised. And if you are a member of ALLi, you know that self-publishing is easy. The next step is obvious.